Before there were museums, there were cabinets of curiosities: rooms filled with works of art, antiquities, and examples of flora and fauna. Intended to provoke awe and reverie, these collections, which emerged in Europe in the 16th century, might appear quirky and haphazard today. Lasse Antonsen’s oddly poetic and aggressive works merge natural history and art. He puts bones and critters on pedestals, sometimes in groups. “Crisis of Narrativity” features nine giraffe shoulder blades upright on black stands. The repetition echoes the minimalist groupings of Donald Judd, but the large, white, fanning bones have nothing of the sterile perfection of Judd’s work. Displayed this way, each reads as art — every crack and stain suggests meaning. 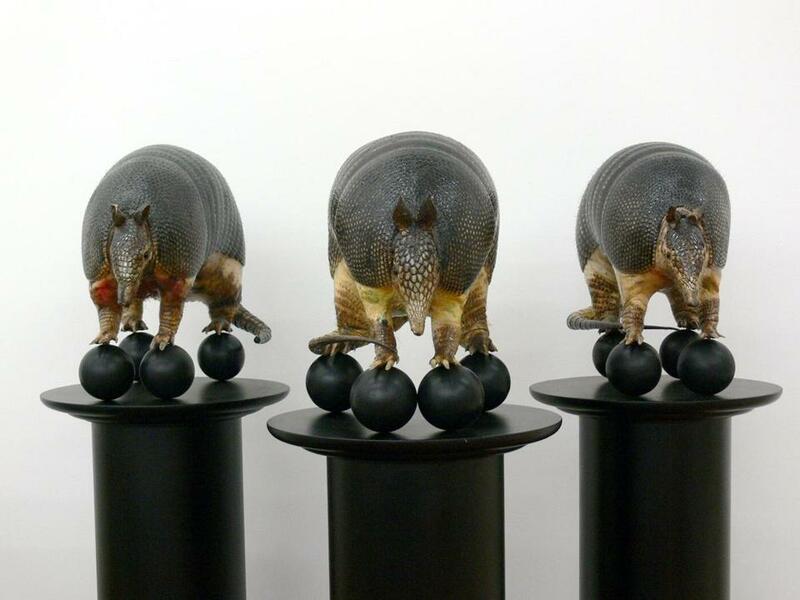 Antonsen’s “Space of Emplacement (for Galileo Galilei)” features three armadillos on pedestals, a bizarre and enticing presentation. They look like trained circus animals, but they’re inert. The title riffs on an essay by philosopher Michel Foucault. The appearance of Foucault and Galileo together in one work of art at the center of “Beyond the Wunderkammer” is perfection: This show is epistemological at its core, exploring how we represent and shape knowledge. Then, those armadillos are just funny: shiny, armored animals with tiny little heads. On pedestals, they look like little refugees from the wild. Our romance with classification lies at the core of Mark Dion’s work. The artist, who will give a visiting artist lecture on Oct. 29 at the Boston Public Library, revisits the early American naturalist William Bartram. His “Travels of William Bartram Reconsidered (equipment)” suggests a wealth of meaning in the intricate sorting of what might have been Bartram’s tools, laid out on a yellow canvas. For photographer Rosamond Purcell, who includes among her photos objects from her own odd collection (such as a giant, rusted, and chained metal book), the focus is reverie. Purcell took an old mirrored mercury bottle and, with certain Shakepearean works in mind, shot the gorgeous vagaries of its swift and clotted reflections. “Caliban’s Freedom” depicts the vaguely monstrous servant of “The Tempest” — sharp and pale, as if made out of bone — stretching to a smear across a landscape. The show includes arcane and romantic works by Steve Hollinger and Jesseca Ferguson. Nostalgia haunts “Beyond the Wunderkammer” with a time when the possibilities of classification seemed new and fantastic, when research was less academic, and more open to dreamers and amateurs. 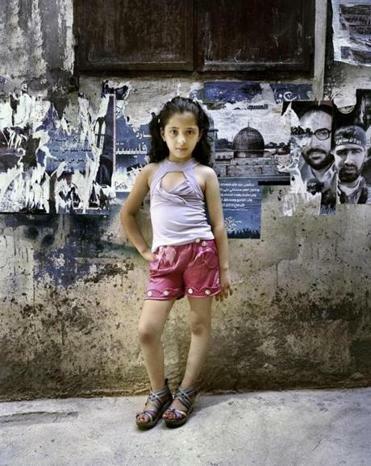 Rania Matar’s photograph “Dania, 9, Bourj El Barejneh Refugee Camp, Beirut, Lebanon” at Carroll and Sons. Rania Matar, whose photographs of girls in their rooms can be seen in “She Who Tells a Story: Women Photographers From Iran and the Arab World” at the Museum of Fine Arts, has an equally delicate and provocative body of work up at Carroll and Sons. Instead of teenagers, she photographs tweens, mostly, capturing their inherently feminine gestures. From girls in headscarves in Beirut to girls in their living rooms in Brookline, the body language is universal. Some preen before the camera. “Dania, 9, Bourj El Barejneh Refugee Camp, Beirut, Lebanon” poses with disarming ease, hand on her hip, painted toenails peeking from rainbow-striped sandals. Her shirt, frayed at the neck, has a peekaboo neckline that would show off her cleavage, if she had any. Then there’s “Hanna, 10, Norwell, Massachusetts.” She stands in a barn, in a neat little blue dress and ballet flats. She looks straight at the camera with an assured expression, but her body is tied in a knot, with arms and legs crossed protectively. It has long been the lot of girls and young women to be looked at and appraised for their beauty. Some enjoy it. Others struggle with it. Matar explores the balance of power between the looker and the looked upon, which in this equation inevitably factors in sexuality. Some girls take on feminine body language long before they hit 8 or 9. It’s often charming and sometimes disturbing. Matar makes us examine what it means for the girls, and for us. 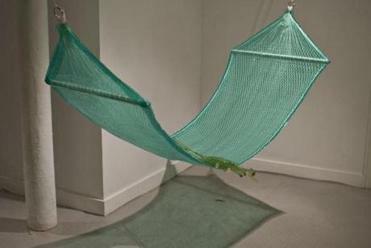 Florencia Escudero’s “Hammock” from “Crypsis” at Distillery Gallery. “Crypsis,” a scrappy group show of recent art school grads at the Distillery Gallery, drapes itself around the loose theme of camouflage. Some of the works baffle: Why, for instance, did Florencia Escudero hang a black curtain down the middle of the gallery? Others are tart and compelling, such as George Heintz and Victoria Duffee’s “Ghilli Suit,” which makes a camouflage outfit from jute and hanks of yarn. The vaguely stooping figure looks like Cousin Itt, and its position — seeming to look at another artwork — sparks a visceral sense of identification in the viewer: the gallery goer’s inner monster. Escudero clad her “Hammock” in clear green plastic and cut a hole from its middle. Light shines through, casting a gorgeous shadow. What this has to do with camouflage, I don’t know, but it’s a captivating sculpture. Randi Shandroski’s “Untitled (Cushion)” blends the plastic on grandma’s sofa with hints of sadomasochism, and pushes the parameters of painting. That’s a lot to pack into one object so eloquently. Correction: Earlier versions of this story gave the wrong date for artist Mark Dion’s lecture at the Boston Public Library.